I find it odd that while we have continued to write and catalogue reports of UFO activity going back to the 1940’s, now contained in 6 Volumes, with another one coming covering the period 1978-1979, we are completely ignored by the media. Time and time again we have been asked for books with a promise to review them and feature our work, so far nothing. Surely this is rather odd in itself? I must profess that this lack of interest in us just spurs us on. At the end of the day these books are not about us, but about those people who have had the courage to come forward and just report what they have seen. We are determined to carry on despite massive personal costs and continuing problems in obtaining the service of a illustrator. Sadly these are times when money is very short and people are more concerned with just coping with everyday life problems…. 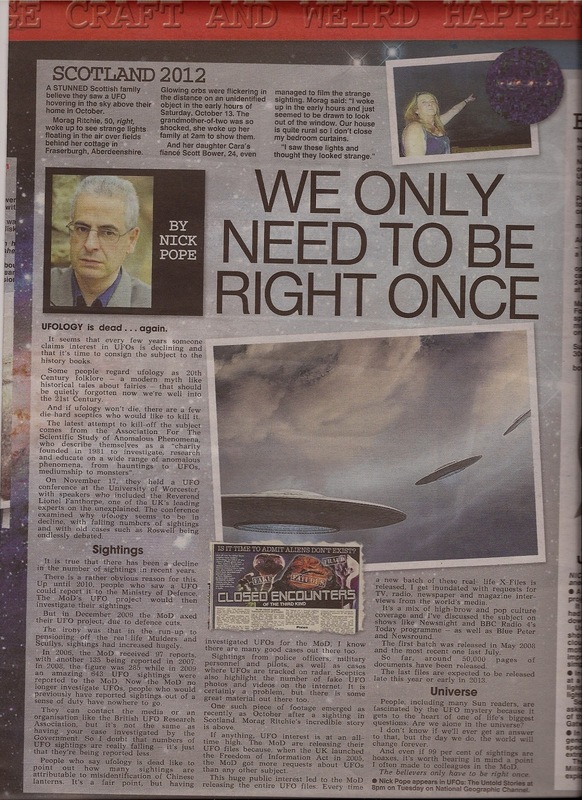 Nick has doe a great job, but I don’t agree with the statistics he hands out, i.e 99% may be hoaxes. Clearly the majority of sightings we have outlined in our books are unexplainable; the evidence of those very personal sightings indicates this to be the case. As far as ASSAP was concerned I was invited to talk but it never transpired, as I was never placed onto the schedule of speakers. "At the time I was a mechanic at Cowley, it was a clear night, no other cars on the road It was like a ball of energy that came down from the sky I was coming home from Oxford to Bicester .When I was near Wendlebury I saw a light in the sky , which came towards me and then turned at right angle before moving just in front of the bonnet, I thought to myself I will run it over so I put my foot down but is still stayed with me. I wondered if it was sort of x raying me or examining me that the impression I had. It seemed controlled in its actions. Then it suddenly shot up into the air and went away towards the direction of Buckingham. When I arrived home I told my Wife she said you should report it, I said no people will think I am a bloody idiot." 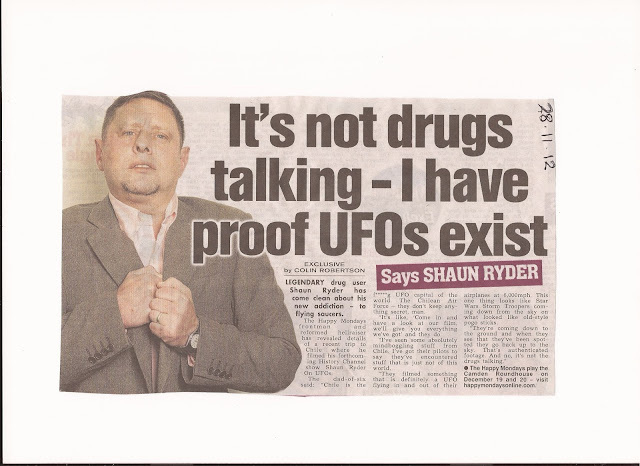 Mr. White told us that the object was totally silent and appeared to be just a ball of energy rather than any UFO. Having read your recent article in the latest NARPO magazine I am prompted to write to you concerning my own experience of an unexplained sighting. This is the first time I have written about it although I did raise the event with my duty Sergeant shortly it happened. In 1965 I joined Kent Police as a 19 year old and after initial training was posted to Gillingham in the Medway towns. Gillingham sits alongside the River Medway and there are unhindered views across the river estuary mouth out across the North Sea to its horizon with the Essex coastline to the left. I was the young probationer Constable on my section who walked or cycled. I never rode in a police vehicle unless it was to take me to the scene of some incident such as a sudden death or RTA where I was left to deal with it. About a year had passed when changes to the members of my section resulted in the loss from it of the more mature officer and I was now considered suitable to drive and patrol in police vehicles. I cannot recall the exact month of this particular night duty but it was in the early months of 1966. I was driver of the area 999 car with a much older Constable crew member from Rainham Police Station. We covered both areas and it had been particularly busy with a variety of calls through the night duty which had commenced at 10 p.m. It was about 2 a.m. when I drove to an area overlooking a car park, a day-time picnic area and outdoor swimming pool at an area of Gillingham called The Strand. It was an area subject to crime and I knew it well. I parked the police vehicle in an elevated position looking over this area facing towards the River Medway which was about 500 yards away. My view also took in an uninterrupted view towards the North Sea and its horizon with the Essex coast to the left. It had been raining previously but had now stopped. It was now a perfectly clear night and visibility was excellent. I could see the lights of the coastal towns of Essex to the left and the blackness of the North Sea and the sky above it on its horizon. I also knew this view well. As I looked through the screen I could see movement of lights forming a pattern hovering in the blackness above the horizon of the North Sea. I asked my colleague if he could see what I was looking at. He told me he could not even though I described where they were. I got out of the vehicle to have a better look and saw that there were about 9 small lights forming a diamond pattern. They were fairly close together and quite clear to the naked eye. I could see the lights of the coastal towns of Essex to the left but these hovering lights were not close to land and were out to sea. The lights were not coloured and appeared to be pulsing slightly. My eye sight was perfect and I was not wearing spectacles or contact lenses. I watched these lights for possibly 20 seconds and they had formed a diamond formation. I initially thought of fireworks or flares but there was no movement by the lights or any diminishing of their brightness. They remained static in the same place and in their diamond formation throughout. I informed my colleague of what I was witnessing but he remained within the vehicle. It was difficult to judge their distance but they appeared to be well out on the horizon, above the darkness of the sea, and far beyond the coastal towns of Essex to the left. They were almost pin sized but quite visible. After about 20 seconds all of the lights suddenly split their formation and travelled away at very high speed. They all went in different directions but in straight lines away from where they had been. One or two went up, others to the left and right and others down towards the sea. They all travelled at high speed and disappeared altogether. It left me looking at the void of blackness of the sky where they had been. I looked at the area for some moments trying to understand what I had seen but they had disappeared and did not return. Stationed at Gillingham with the North Sea and River Medway on my doorstep I had seen fireworks and flares discharged previously but these lights were not the same and were neither. I got back into the police vehicle and told the officer with me what I had seen. A short time later we went to Gillingham Police Station. Whilst there I looked at our Force Policy Book which covered all work practices and procedures by Kent Police. There was a section dealing with unexplained sightings and UFO’s. It advised how to report such matters. As I was still a Probationer Constable I spoke to the duty Sergeant who was a very mature and experienced officer who had been stationed at Gillingham for many years. I told him what I had seen and I then suggested that I should report the matter as per Force Policy. He dismissed this idea and I took no further action. I had many postings throughout my service and I was stationed several times within the Medway Towns in various ranks. Of course there were many times when I wondered just what I had seen back in 1966. In 1995 I retired from Kent Police as a Superintendent and by coincidence my house was situated on high ground about one mile inland from The Strand. It provided an uninterrupted view across The Strand, the River Medway and out to the North Sea with the Essex coastline to the left. I often looked out across this view at night but I never did see the diamond formation again. 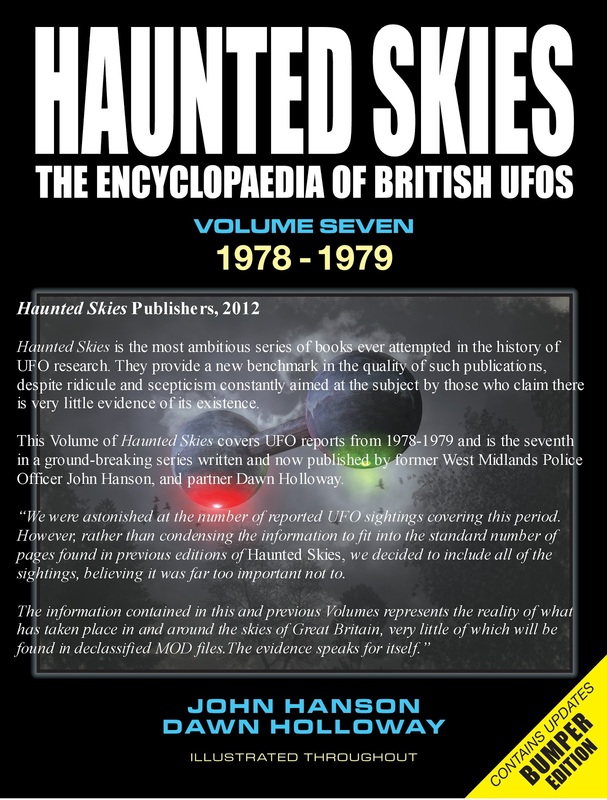 Haunted Skies blog the facts about UFOs!